Interactive Brokers is Dangeous for Options & Futures | Stay Away! 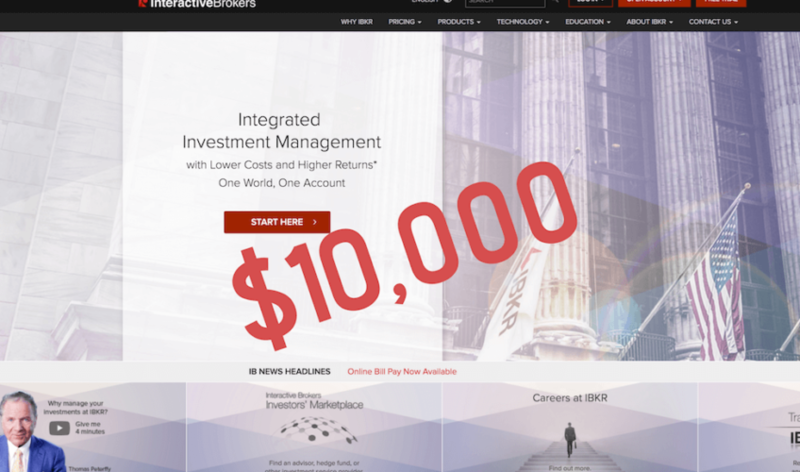 Interactive Brokers is one of the largest online discount brokers in the world. They average over 1,000,000 client trades every day, and they offer an incredibly wide array of products to trade. However, all current and potential IB traders should be aware of some serious issues with options and futures trading that IB has and other brokers do not. Namely, IB has auto-liquidation, inactivity fees, high minimum requirements, and poor customer service. Read on to see what happened to my IB account with $125,000 in it. 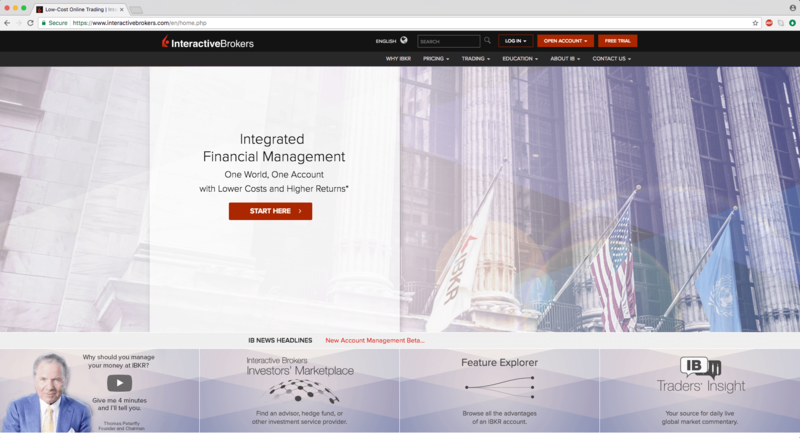 A lot of professional traders, hedge funds, and other institutions choose Interactive Brokers as their broker for stocks, options, futures, and forex in the US and abroad. We can see why. On the surface, Interactive Brokers looks like a great choice. They have very cheap commissions and offer access to products that other brokers do not, like US dollar futures that trade on the Mexican Derivatives exchange or options on Euro-Bund futures. That’s great, but what’s the catch? 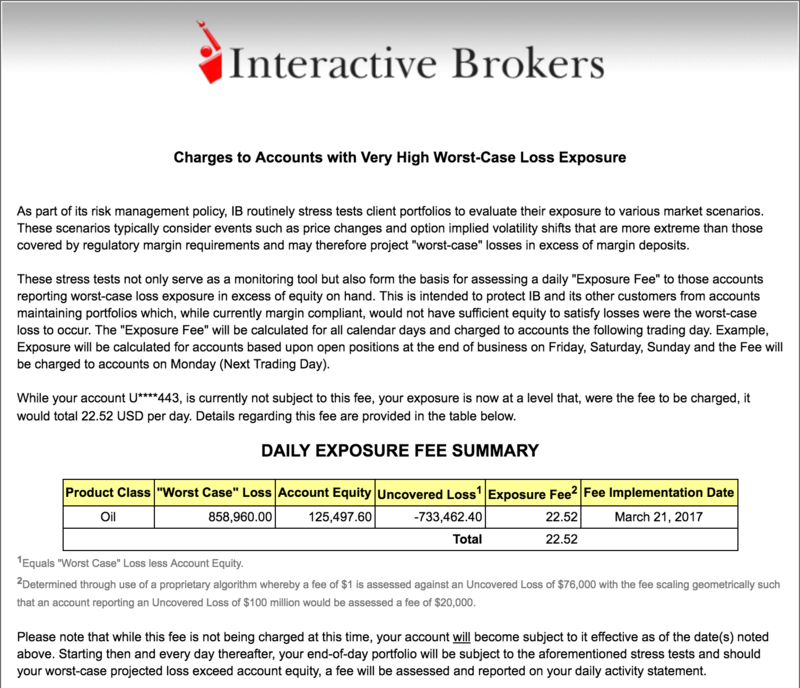 First, there’s a hidden cost of trading with Interactive Brokers. For one, IB charges for order cancelations. The exact pricing structure for canceling orders is opaque and not easy to understand. Order cancellation fees are off-set be executed trades, but the problem occurs when total cancelled orders exceed the number of executed orders for the day. Very few brokers charge for oder cancelation, and IB is one of them. We still aren’t sure how much we have paid in order cancellation fees, because it’s literally that difficult to understand with an account that has high-volume transactions. Second, there are inactivity fees of $10 per month, which don’t sound like a lot, but if you leave your money sitting in your account (assuming you have less than $100,000), you’ll lose $10 every month which is pointless. Zacks Trade doesn’t have any inactivity fees. I like to put on a lot of futures positions and short options positions, and IB was not happy with this. We received emails notifying us of “exposure fees” almost everyday. Eventually, IB’s risk algorithms closed out our positions – but we closed out our account, so the joke is on IB. We we’re paying about $24 a day just to maintain a short crude oil futures position of 20 contracts. So ridiculous! The worst part is, there’s no negotiating this fee. IB is not paying employees to actively look at the risk of all of their client accounts. Instead, they have an algorithm that determines the daily exposure fee pricing and charges clients accordingly. We held this exact same position with three different brokers and there was no problem with the margin risk team at all – IB was the only brokerage firm that gave us a hassle. We this said, we had an account with Interactive Brokers for approximately three months, and it was the worst three months of our lives – seriously. Not only were we charged a bundle of stupid fees, but we also had several of our positions auto-liquidated that resulted in moderate losses. In one instance, we had too many futures positions in our account, and our margin buying power temporarily went negative due to futures exchanges raising the margin requirements for their products. IB’s risk algorithms promptly liquidated several of our futures positions without warning. With TD Ameritrade, Ally Invest, TradeStation, Charles Schwab, E-Trade, Zacks Trade and every other online broker that we’ve ever transacted with, they ALWAYS reach out via email or phone about a margin call and usually provide several days to meet the margin call by depositing additional funds or closing out a portion of the position. IB did not provide us this courtesy. We were certainly not the first IB clients to have issues with auto-liquidation algorithms. A small options trading hedge fund, Glen Lyon Long Term Options LP, filed a lawsuit against Interactive Brokers after their liquidation algorithm closed out a basket of short options positions due to mis-marked bid/ask quotes. To throw gas on the auto-liquidating fire, when IB’s risk algorithms decide to liquidate a position in an account, they do it at any available price – read that again. In the case of Glen Lyon, IB liquidated short options positions at prices well beneath the NBBO levels, resulting in steep losses and a margin deficit of over $200,000 in a matter of minutes. This causes more forced selling and an eventual account blow up. “When an auto-liquidation occurs at prices that are outside the market it can easily put an account into a death spiral,” said Craig McCann, an economist in Fairfax, Virginia. Options spreads can often be very wide for a number of reasons. Say you’re short $50 puts that are expiring in 10 days on a $60 stock. The ask on the $50 puts, because they’re so far out of the money, could easily be $0.50 and the bid could be $0.05. IB’s algorithms would easily flag this as a “high-risk” situation and go on a liquidating rampage. Even if you shorted the puts at $0.30, for some reason, IB tends to not care about getting the best prices for their clients with options trades. The nightmare would occur when IB liquidates the short options position at a price like $0.45 per contract, even though the bid is $0.05. And this happens! Plus, if you think the daily exposure fee for out short futures position is a gyp, the daily exposure fee for short options positions is ever worse, because the theoretical losses are much greater – if not unlimited. There are also known issues with Interactive Broker’s order routing methods. If you don’t want to use IB’s “smart-routing” feature that routes options orders to exchanges where Interactive Brokers can take the opposite side of the order and literally trade against you, you’ll be charged a minimum of $1.00 per contract instead of their low pricing of $0.15 per contract. This is counterintuitive to IB’s deeply discounted commissions claim to fame. Our aim is not to speak negatively of Interactive Brokers. Rather, we are merely trying to state the facts and expose the truth. And in this case, the truth is that Interactive Brokers is simply a bad choice of options and futures traders. There are hidden fees, absurd auto-liquidating algorithms, and unsympathetic customer service that won’t be on your side. If you’re going to trade options or futures with IB, don’t say we didn’t warn you. 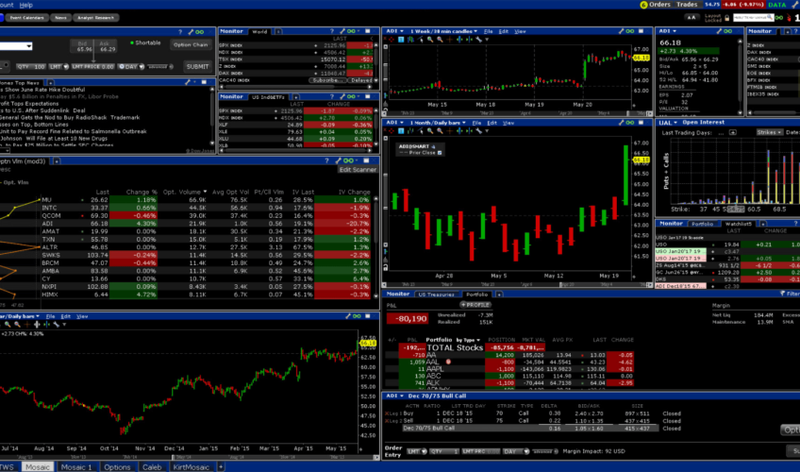 A much superior online broker to Interactive Brokers is Zacks Trade. Read our Zacks Trade review to find out why. In short, Zacks Trade has no inactivity fees, a much lower account minimum, an no fees to cancel or modify orders. Plus, Zacks Trade has much better customer service, and the phone wait times are much shorter, because they don’t have over a million clients. Zacks uses the same software and clearing firm as Interactive Brokers. Check out these three other online brokers, all of which are better than Interactive Brokers.